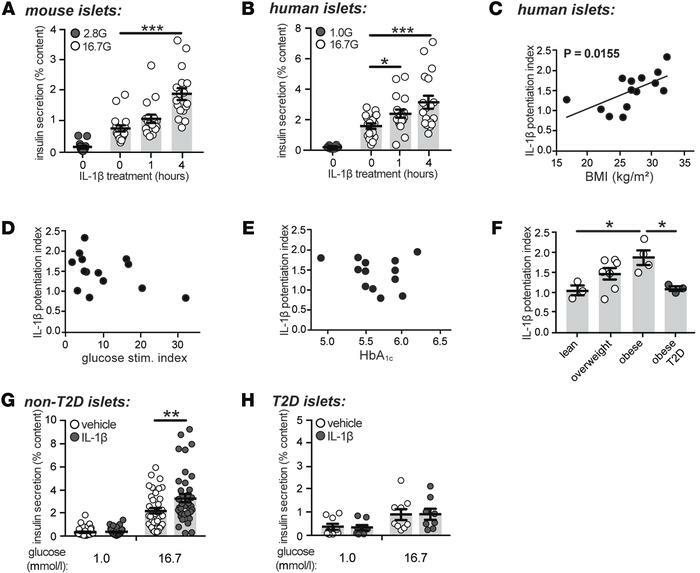 The stimulatory capacity of IL-1β is correlated with BMI and is absent in type 2 diabetic islets. (A and B) Insulin secretion normalized to percent insulin content from (A) mouse (n=15, 17, 17, 17; 6 experiments) or (B) human islets (n = 18, 18, 18, 18; 6 donors) following exposure to IL-1β (10 ng/ml), as indicated, and stimulated with 1.0 (1.0 G), 2.8 (2.8 G), or 16.7 (16.7 G) mmol/l glucose. (C–E) The potentiation index of 1-hour IL-1β treatment plotted against (C) BMI (kg/m2; n = 14 donors), (D) glucose stimulation index (n = 14 donors), and (E) glycated hemoglobin (HbA1C; n = 13 donors) in nondiabetic human islet donors. (F) Comparison of IL-1β potentiation index between type 2 diabetic (T2D) and control islets according to BMI tertiles (lean < 25; overweight 25–30; and obese > 35 kg/m2) (n = 3, 7, 4, 3 donors). (G and H) Insulin secretion normalized to percent insulin content from (G) nondiabetic (n = 41, 36, 39, 39; 14 donors) or (H) T2D human donors (n = 9, 8, 9, 8; 3 donors) treated for 1 hour with vehicle or IL-1β (10 ng/ml) and stimulated with either 1.0 or 16.7 mmol/l glucose. n values correspond to data points from left to right, respectively. Data are mean ±SEM and were compared with (A, B, G, and H) 2-way ANOVA followed by Tukey post-test, (C–E) Pearson correlation coefficients, or (F) 1-way ANOVA followed by Tukey post-test. *P < 0.05, **P < 0.01, ***P < 0.001, as indicated. G, glucose.